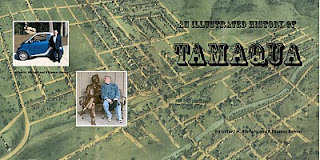 Gifford H. Albright and R Thomas Berner are pleased to announce the publication of An Illustrated History of Tamaqua. The 120-page book contains photos and short historical essays about the photos. Albright is a native Tamaquan and Berner grew up there. Albright graduated from Tamaqua High in 1948 and Berner in 1961. This endeavor has enabled us to reminisce and we hope it will do the same for you. As we were compiling this, we remembered places we had played as children, train rides we had taken to faraway cities, politicians who had come to town on trains to campaign, schools we had attended that no longer exist. We have benefitted from the work of others and while we list our sources at the end, we happily acknowledge the work of Paul Scherer, whose Musings of a Chronicler were compiled on a CD—with old photographs—by Bob Betz. A third person whose work made our job easy was David Bensinger, who compiled old postcards of Tamaqua, some of which appear here. We especially salute Bob Betz for taking the time to look at our final manuscript. And we thank Micah Gursky for providing a copy of an old map that we tweaked in Photoshop to create the cover. We note a certain irony in this compilation. We never set foot in Tamaqua to do any research, but were able to find our sources either online or, in the case of the Scherer collection, on a CD purchased many years ago by one of us. We communicated via e-mail. We need to emphasize that we are not historians and have not sought out primary sources to confirm what we learned from secondary sources. We also want to emphasize that this in no way is a definitive history. If we did not have a particular image, we did not write an essay. We debated how far afield to go in each essay and decided that for the most part, each essay would focus on the image and that we would seldom update to provide current information. Sometimes we used an image to represent something larger. The Tamaqua Unions allowed us to mention modern championship seasons. In our selection of photos, we aimed to be representative. We had three times as many photos as we used but wanted to keep the book to a reasonable length and price. In order to hold down the price, the authors are forgoing royalties. There's a Facebook group called Tamaqua Then and Now and it says: Tamaqua was the kind of town that embraced you and made you part of the family. Fits right in with your comment.